These pork patties on skewers are ridiculously easy to make and delicious. I ate WAY too many of these and have no regrets. Heat a small frying pan to medium and add the rice. Stir for four or five minutes until the rice is golden brown. Cool for 5 minutes than place in a mortar and pound with a pestle until finely crushed. In a large bowl, add the crushed rice, pork mince, egg, spring onions, garlic, fish sauce and sugar and mix well to combine. With wet hands form 24 uniform balls and thread three patties on each skewer. Refrigerate the pork skewers for 30 minutes before placing on a hot grill (or grill pan) for 10 to 12 minutes or until cooked through. 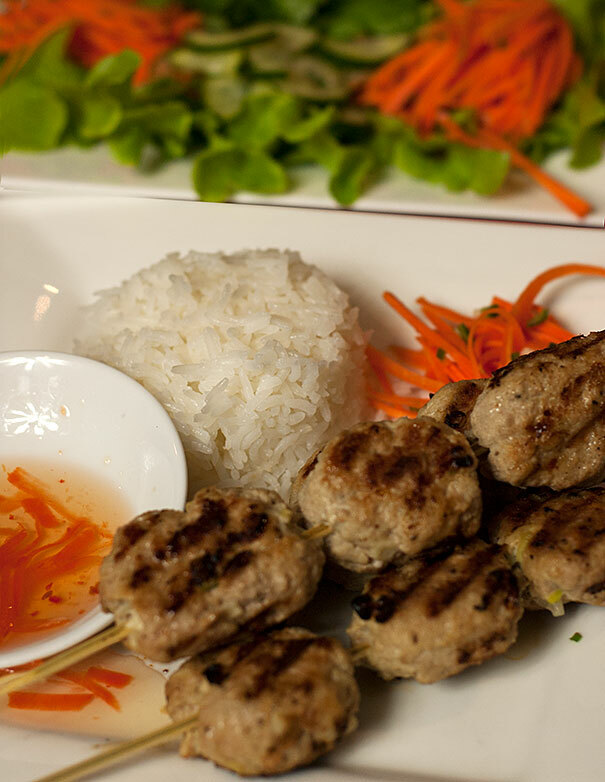 Serve with pickled vegetable salad, dipping sauce and peanut sauce for happy faces everywhere.